Cisco Meraki, the global leader in cloud managed IT solutions, has announced its offerings to help Micro, Small and Medium Enterprises (MSMEs) in Nigeria simplify IT. With many organizations today dealing with the challenges of lack of funding for advanced digital solutions and a lack of IT specialists to manage those solutions, Meraki provides a simplified path to powerful technology. 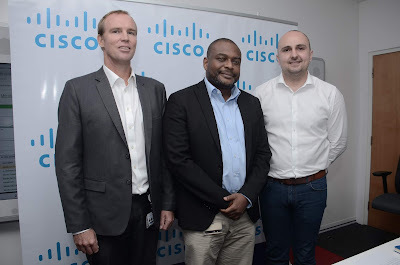 L-R: Steven Kewley, EMEAR Commercial Regional Manager, Cisco; Olakunle Oloruntimehin, General Manager, Nigeria and West African Countries, Cisco; and Nick Malherbe, Territory Manager for Nigeria, Ghana East and Sub-Saharan Africa at a press conference held to launch Cisco Meraki. The company announced these offerings at a round table held at the Cisco Office, Victoria Island, Lagos on Tuesday, February 26, 2019. According to Cisco, digitization is the big trend of today and it is important for businesses, whether big or small to adopt digitization. The new Meraki offerings are designed to simplify IT solutions for small and medium businesses even in the absence of an IT specialist. The technology provides complete network visibility and control - no hardware controllers or overlay software required. Configurations and management are easily performed remotely or on-site, while trouble shooting can be done in a fraction of the time with advanced networking analytics, allowing businesses to focus on more projects that are impactful. Speaking at the event, Olakunle Oloruntimehin, General Manager of Cisco Nigeria, remarked, “Cisco Meraki creates the simplest, most powerful solutions, helping everyone from small businesses to global enterprises save time and money. It helps organizations to rapidly roll out digital initiatives, delivering real business value. We are committed to helping our customers overcome challenges and achieve their goals. Technology can connect us, empower us, and drive us. At Cisco, we believe that by simplifying powerful technology, we can free passionate people to focus on their mission and reach groups previously not utilizing technology”. All Cisco Meraki devices are centrally and securely managed from the cloud using a single web-based dashboard. Their feature-rich, intuitive architecture enables customers to save time, reduce operating costs, and scale as a business grows. Substantiating the importance of simplified IT solutions, Nick Malherbe is the territory manager for Nigeria ,Ghana, east and subsaharan Africa , explained the need for businesses to use data smartly and securely for business success. He said, “In Nigeria, small and medium businesses account for 84% of employment attesting to the fact that they contribute greatly to the GDP of the economy. The success of this sector is key for the success of our economy, it is therefore imperative that these businesses use IT solutions that are secure, simple and intelligent. With Cisco Meraki, these MSMEs can enjoy agility, operational efficiency, and most importantly, data security that they require to accelerate their digital transformations. Our goal is to help customers benefit from digitization by simplifying IT solutions”. Since inception in 2006, Meraki has grown to become an industry leader in the IT space, with over 230,000 customers and 3 million network devices and counting online around the world. Meraki was acquired by Cisco in 2012. The Company’s comprehensive set of solutions includes wireless, switching, security, communications, EMM, and security cameras, all managed through Meraki’s web-based dashboard interface which allow customers to seize new business opportunities and reduce operational costs.